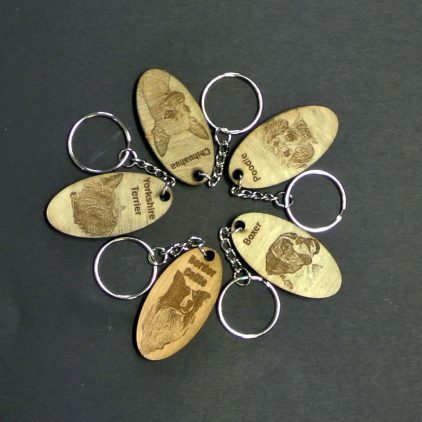 Laser Cutting and Engraving is great to preserve your memories. See the description below to see all the great times photo engraving is the perfect gift. Upload your image for photo engrave. Text is optional, please note that the image size will be changed with the amount of text added. The default for added text is underneath the image. If you would like it in a different place, please note that in next field. 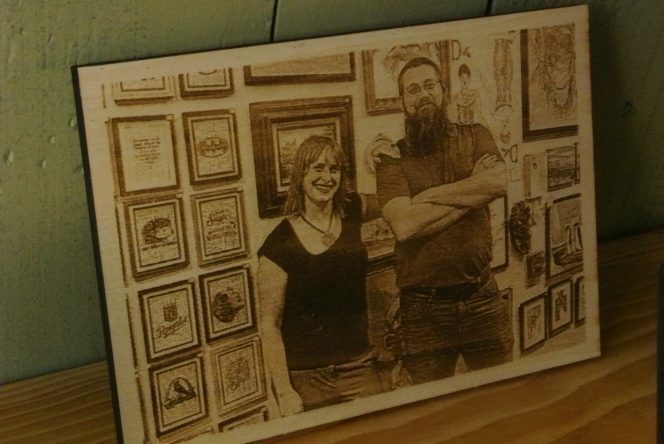 Frames are a perfect way to finish your laser cut photos. 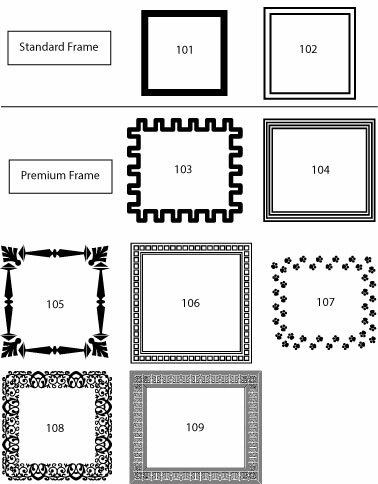 Please refer to the photo for frame choices. This option is for a border around your photo. If no is selected, then the photo will go to the edges of the wood. If yes is selected, it will leave a 1/4″ border around the photo. Add a quote, your own words, or remind yourself who is in the picture by putting the names of the people in the photo. The back side text addition is the perfect way to personalize your photo and keep the memories alive. Photo Engrave wall hanging comes in many sizes. Keeping your memories close is undoubtedly very important. Therefore, take your treasured photos and enjoy them with with a Laser Photo engraving. 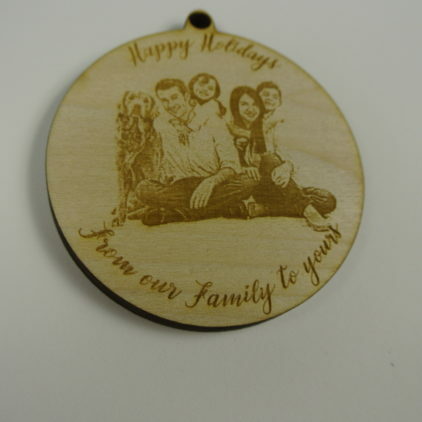 Photos are engraved on a thick basswood with a keyhole on the back for hanging. 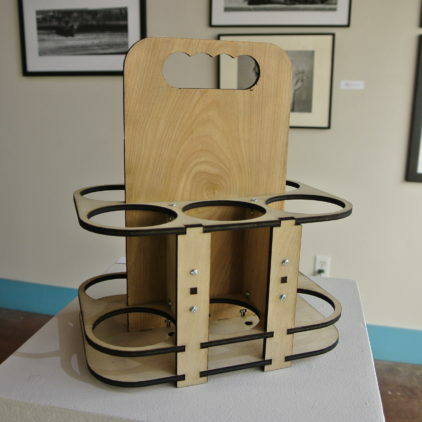 Equally important to great photos for yourself is getting great gifts! What are Engraved Photos good for? After the wedding is over, many times all those special photos sit on a computer. Use our photo engrave to give a gift that you can treasure forever. Most of all, put the wedding date to the photo! Add a special quote or advice to the back side. This is a gift that will remind them of their special day forever! Have you had a family reunion lately? With everyone so busy and in some cases so spread out, you especially want to remember the times when you are together. First of all, you snapped a great shot or maybe you hired a photographer to capture the special occasion. Why get that photo when it stays on the camera? The photo engrave is a perfect way to get that treasured memory on the wall. 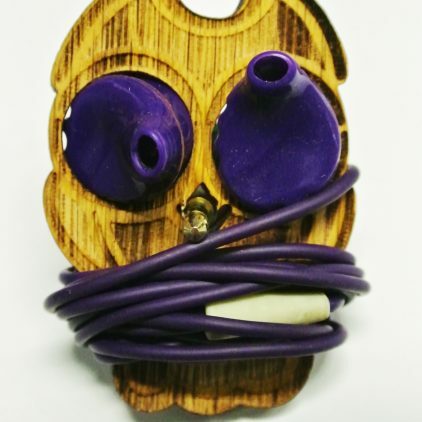 It is not only a unique piece for you to remember but all your guests will ask you about your unique piece of Art with your family at the center. We recommend the 8×10 size or larger for family photos. You can also get multiple ones to give as perfect personalized gifts for everyone in the photo! Don’t forget to add the date! Getting a degree is a huge accomplishment and is a great time to celebrate and must be remembered! Take that professional photo of your graduation and turn it into a laser photo engraving! What about getting your diploma photo engraved! Get a professional scan done and upload it to the ordering system. pick your size and get a great reminder of your accomplishment. What is your special occasion that you want to remember forever in a unique way? new baby? first steps? Valentine’s day? engagement photos? memorial?